Have you ever noticed how water can flow through rocks and leave a trace of its passage by covering the surface with a patina, like white stripes? The whole process is quite complex but can roughly be explained by breaking it down into two coupled effects: gravity and chemical reactions. Gravity causes the water to infiltrate through discrete fractures (hard rocks) or pores (sedimentary rocks), until it charges the groundwater supply below to a point where excess water will surface on the face of the rock, like an overflowing glass of water. Chemical reactions, on the other hand, allow water to dissolve carbonates and similar substances present in the rock. Such chemical compounds will start sticking and accumulating on the surface. at Halibut Point State Park, Cape Ann, MA, United States. 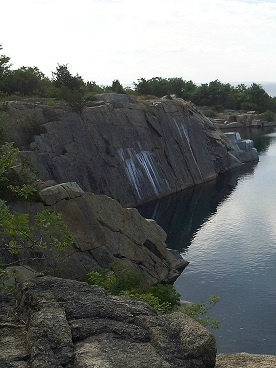 The phenomena of water flowing through rocks can be witnessed in nature, such as in the Halibut Point State Park in Cape Ann, MA (shown above). These rocks are made of 400+ year-old layers of granite, one of the most common types of rock, named for its granular texture. As you can see in the picture, the flux of water in those rocks is visible on their surface, giving way to streaks of a lighter color on their surface. The free flow of fluids through a fracture, in a block of solid or porous media, is what’s called a discrete fracture. If you are interested in simulating discrete fractures, you can use COMSOL Multiphysics together with the Subsurface Flow Module. 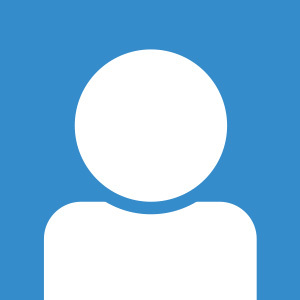 In fact, our Model Gallery features a great Discrete Fracture documented example. 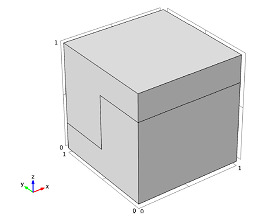 The image below to the left shows the geometry used in this model, which consists of two blocks sharing a common interior boundary representing the discrete fracture. To the right you can see the analysis of time-dependent flow in the fractured porous blocks after 1000 seconds. Geometry of the discrete fracture. Analysis of time-dependent flow after 1000 s.
The two blocks are made of porous media, while the shared interior boundary represents a discrete fracture. 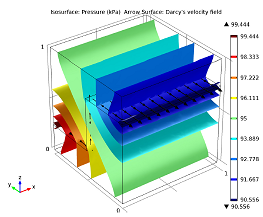 The Darcy’s law physics interface is used to solve both the porous media flow and the fracture flow. The fracture is represented as an interior boundary, meaning Darcy’s law is solved on the surface instead of in a volume by adding the Fracture Flow feature to the Darcy’s law interface. Doing so avoids creating a very thin domain representing the fracture that would lead to a dense mesh consisting of very small elements. In other words, this is a very efficient way of solving this type of subsurface flow problem. The isosurfaces in the plot to the right show how pressure is continuous across the fracture, a characteristic of subsurface flows, while arrows indicate the velocity field along the fracture. The fluid is moving from the inlet (right) to the outlet (left) because of an imposed pressure difference. Now we know that water will surface thanks to discrete fractures in the rock and white stripes will appear because of chemical reactions happening on its external surface. You will find more details on how to run a discrete fracture simulation yourself in the documentation available in our Model Gallery.